Addis Ababa University Women’s, Youth’s and Children’s Affairs Office in collaboration with Regb Ethiopia Civil Society and Ministry of Health organized a half day training and awareness creation for university students on cervical cancer and HIV/AIDS on April 6, 2019 at Mandela Hall. 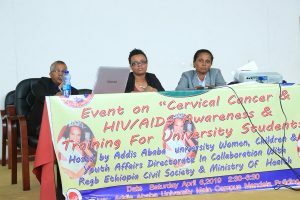 W/ro Matebe Tarekegn, Director of Addis Ababa University Women’s, Youth’s and Children’s Affairs Office during the event noted that educating young people about HIV improves their self-confidence and ability to make informed choices until they are mature enough to protect themselves from HIV. 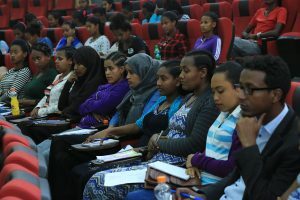 It is vitally important to pay special attention to vulnerable young people and those at especially high risk, said the director, making sure that every young person in every community is equipped with the facts about HIV/AIDS and how to prevent it. “The environment in higher institutions of learning is characterized by high level of personal freedom and social interactions. “Socially, a higher institution of learning offers opportunities for high level of networking, freedom and peer pressure featuring a high level of risky behavior. Organizing such dialogue is important to build up students’ awareness about their health and let them work to achieve their goal,’ added the director. Mitike Molla (PhD), Vice President for Research and Technology Transfer of AAU in her opening remarks stated “Such event is very necessary for adolescents to develop their awareness, attitudes, values and decision-making to make sound health-related decisions. The event features presentation and panel discussion. In attendants were university students, health professionals from Ministry of Health and invited guests.